Paul B! Always a welcome surprise! If you dare play two House tunes in a single show, that new Counter Intuits is great. @Nate K - I just might!! Hey Paulie B -- nice surprise! I've got the ear goggles on and I'm listening live! What happened to/with the Great Brian Turner?Not to Diminish the Kingly P.B.Show. @Mike Sin - my pisano! @Inquiry - Brian is sadly no longer with the station. We miss him but he's doing great! @Steve - You know Numero and their wacky archival formats. Thanks for catching that! Play some new Death Grips! Heya Paul and music lovers. Kinda like these page colors; sort of Bazooka Joe bubble gum looking. Dancing With My 80's Wife? Someone's dancing in the studio! Also, I'd really hoped the Huskers recorded something on a cylinder. The Damned didn't sound anything like this when I saw them last week. This Jackie Shark tune is cool. Never heard this punk before. Caught your last show, Nate. Pretty swell, especially the Kinks. i would have thought "chizzik." Saw Visible Targets many times while in High School. Mick Ronson produced their EP. TV Toy was from Dover NJ. The drummer Steve Peer went on to play with Bill Nelson in Red Noise. Strangely & randomly reminded of long-defunct (?) local (DC) outfit Pitchblende with dis here.. Interesting Rev, yeah Pitchblende long gone far as I know. Tuning in from the Left Coast. ^ Man I love Pitchblende. I'll play something next week to sate...thx again Paul!! Heh! Creamo: If you go that far, you gotta dig up some of Treiops' solo stuff .. project called Triptych of a Pastel Fern .. might be a better fit for Mr.Coulter, come to think of it..
MA were from Athens, GA, yes? I loving your choices Paul. Thank you! Yes, haven't heard this in a long time. @Rec Yeah that guy's got one of the best names too. I liked that Omni song more than anything else I've heard by em. Not too shabby. the radio work with internet ??? This is making a slow day at the shop move quite nicely. I need air! There 's no let up, what a smoking set. @france, without the internet stream, many of us would just be banging our heads against the wall until our ears rang. Can always count on Moodists for a supremely grinding bass groove. Don Fleming was at the To Live & Shave In LA show the other night. 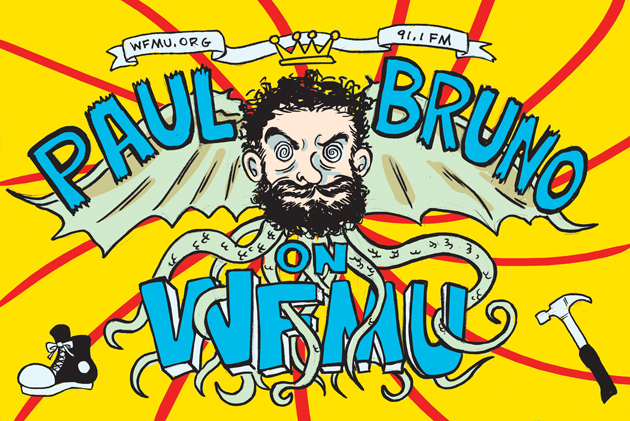 This was going to be the first Spin Age Blasters I was able to catch live at it's Summer time slot and it turns out to be a killer fill-in, go Paul Bruno!!! Yay, Come was a great,great band. great show, DJ Paul B. Thanks! I need to go update my will to state that if a clergyperson cannot make it to my funeral, then my estate will summon Paul Bruno to come and DJ the services. Well, if I actually had a will. Loving the show. Excellent picks. Loads of good and quirky! fill in more often!!! this show rox!! and thanks for the Tuxedomoon, too.